7 women and 12 tween and teen girls joined my daughter and I for a mother/daughter tea party a few weeks ago. I pushed aside furniture, wrote out some name tags, and somehow crowbared them all into my teeny-tiny dining room. We played parlor games, ate food, laughed hard, and learned about being ladies who take the Truth of God's Word with us wherever we go. In one quiet moment, one of the moms causally tossed out the question that was perhaps on everyone's mind, "Why did you do all this? What made you want to host a night like tonight?" Well, it was quite simple. "Investment." That particular night was about investing in the life of my daughter by investing in the lives of her friends. It was about creating a space where memories are made and faith is formed. It was about shaping a home that is life-giving. Scripture would call that hospitality. And it's something that all Christians are called to do. It's one way that we can be love wrapped in flesh. And so, I open my home. I embrace scruffy hospitality knowing that my imperfections...my messy kitchen, my over-salted meals, my mix-matched service ware...reveal my need for Christ. I gather people around my table. I linger. I love. I open my arms wide to those who need a safe place to land because sometimes a hot cup of coffee and a listening ear is a simple way to gently wash the feet of those who need it most...it's a no-frills way to bring life into their lives. That's what I want for my people. That's what I want for my home. I've hosted a lot of gatherings around my table. But while the themes and events have changed, the human need to belong has always remained the same. 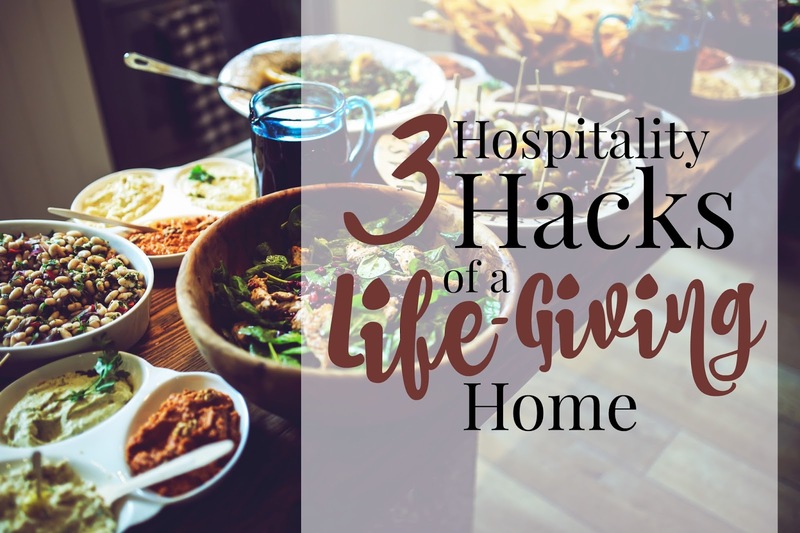 Over the years, I've come up with three simple hacks to allow me to have open-home hospitality with ease. By year ten or eleven, I had cupboards full of dishes...none of which matched or went with the current decor of my kitchen. Because the truth is, over time, my dishes broke. Four out of the five sets. They got chipped and cracked and lost. At best, I could scrape together an entire table setting of Christmas dishes and enough matching everyday-plates to serve five or six. Did I mention there are seven people in my family? So, I made the decision to purge the clutter and switch to all white dishes. I began picking them up at tag sales, yard sales, and thrift shops for a few pennies each. 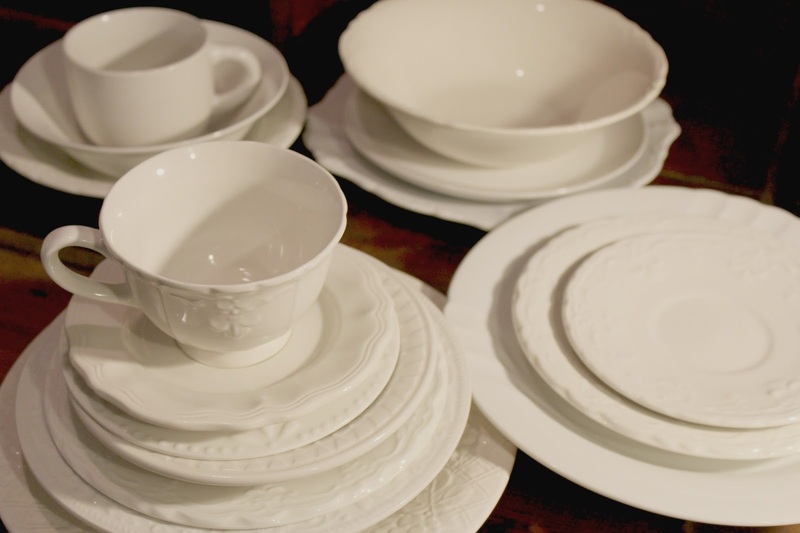 I brought them home and pieced together an ever-evolving collection of shabby chic table ware. One peak into my cupboards shows a healthy stash of disposable tin meal trays. I buy them often at the dollar store and squirrel them away so that I always have them at-the-ready. When a neighbor is sick, a friend has a baby, or someone in my community is in a financial bind, I can bring him/her a no-hassle meal in minutes. Whether I take a meal I had made weeks ago out of my own freezer to stick in theirs or prepare something fresh to drop off at the dinner hour, I always like to hand over my offerings in an eat-and-toss container. My friend-in-need can enjoy a hot meal and not have the burden of washing and returning anything to me. 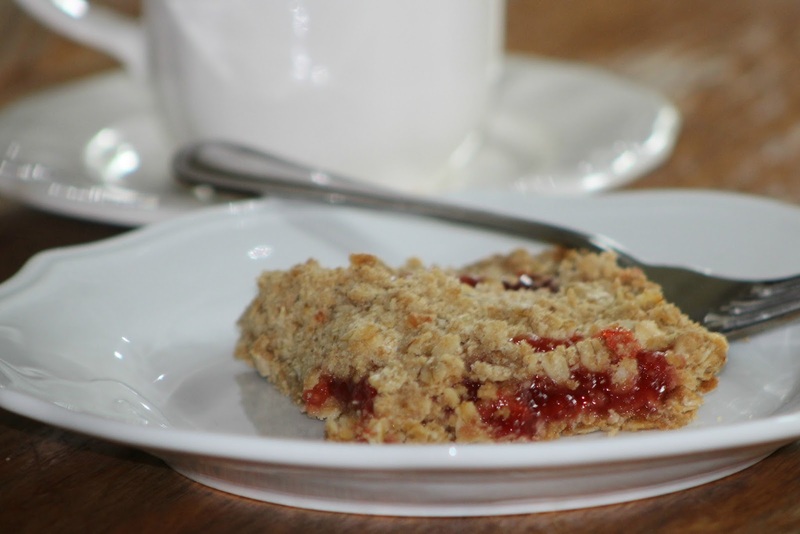 If you invite me to a potluck or party, I can guarantee you that I will bring Strawberry Bars. If you're sick and in need of a meal, I'll deliver Chicken Alfredo (or sometimes Scalloped Potatoes and Ham), salad, and homemade bread to your door. Pinky swear. I rarely ever change course. I make these dishes and have made these dishes for every event outside my home for the past four years. While, it might sound kind of boring to always bring the same thing, the truth is, most people in need are just so grateful for something hot and tasty to eat, that they never notice what is or is not included on the menu. Food made and shared with love is always appreciated. Saying YES to a default meal plan, however boring, means I can freely say YES every time I'm asked to bring food. I make it a point to always have the ingredients on hand and can whip up a meal from memory in just minutes. No decision fatigue when trying to choose what to bring. No random trips to the store at the last minute to grab ingredients. No worry about whether the meal will turn out tasty. I stick to the same-old-same-old because simple means doable. In a stand mixer, mix the first five dry ingredients. With mixer on medium speed, drop in pats of butter, one tablespoon at a time. Slowly mix until the dough is course and crumbly. Pour half of the oat crumble/dough into a greased 9x13 casserole dish. Spread evenly. Top with dollops of jam. Then, layer the rest of the dough crumble on top. Spread evenly. Bake in a 350 degree oven for 30-40 minutes. Cool slightly. Serve hot or cold. 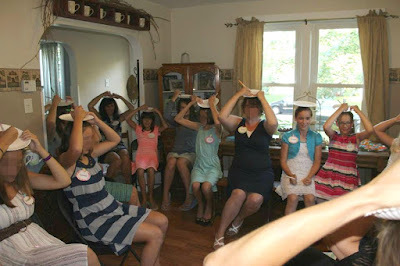 In two weeks, I'll be gathered in my living room with a dozen or so homeschooling mommas. I've invited them over for a back-to-homeschool party. Currently my kitchen is under construction and my living room carpet could use some prayer. But, we'll all be gathered just the same. We'll sip coffee and share stories. We'll huddle together in solidarity, carpet stains and all, because I choose present over perfect. I choose to create a home that gives life. I choose to do small things with big love. I choose to invite the broken, the tired, the hungry and position my days for hospitality. I really enjoyed this post. I also learned a few things too, thank you. Hospitality is one reason we chose our home; it has a big living room. We have had Bible Studies, parties, potluck fellowship, clubs, and even church in our home and will continue to. Opening your home up to hospitality can be a huge blessing to you and to others. In fact, this past Sunday we invited our (small) church to come over for a BBQ (third one this Summer). One sweet lady who is pretty quiet came and really opened up; it was wonderful. However, hospitality also has a downside. One thing I've noticed is that some people do not value hospitality. We have people who cancel at the last minute by text, don't show, or are too busy. It is sad, but we (my husband and I)sometimes wonder if we should invite certain people because they exhibit this trend. What really hurts is when we invite friends to something our kids are excited about and they don't show. Two years in a row we invited a bunch of people to their joint b-day party and though everyone seemed excited about it only one family showed. My children both started clubs with their friends, the parents seemed excited about it, but only came once to my son's Lover's of Lego Club and only a handful of times to my daughter's Bible Kids' Club. We've had to put both clubs on hold. I am not trying to discourage anyone from starting, but just let them know that these things happen sometimes. If they do, try again, the friendships made and deepened during hospitality are worth it. I, agree, that is a problem. But, we are called to be hospitable whether our hospitality is well-received or not. I, too, get discouraged when I put out invites and receive rejection or lack of enthusiasm. But in the end, I can't control how people respond. I can only control my obedience. Thanks for your thoughts. These are words that needed to be shared. I enjoyed your post. Rendia, a good way to avoid discouragement is to ask people to be frank about their interest from the beginning, to tell whether they will be full-time attenders or part-time or not attending at all, and/or to set a deadline for an RSVP. My guess is they are afraid of hurting you or your children's feelings if they have to decline so they ride the fence or wait til the last minute, but honesty is the best policy. And if they are honest, don't hold it against them--they may have very God-honoring reasons they have to decline. This request for frankness may help avoid last-minute notice or hemming and hawing. 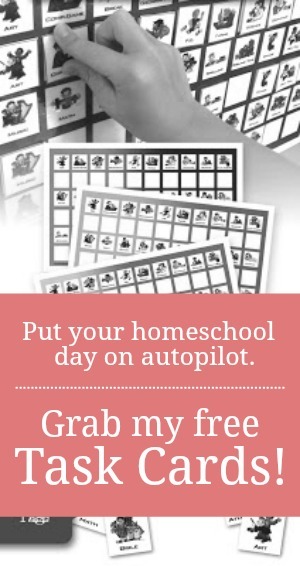 As far as the clubs, I believe in the homeschool community, many parents have already stretched their participation in group activities to the max--they may have reached their "one club or activity per child" limit. It could be their children are already doing a particular Bible study at home and to add another one would be confusing to them--"too many irons in the fire." Especially children who have trouble with initiative, staying organized, or have a learning issue. I have one of those. Parents and children likely mean no harm in declining your children's invitations to clubs, but they should be honest from the beginning. Hearing your intentionality in this area of Christ-following is just what I needed today. I, too, don't care much about "putting on the ritz" for our guests...I just want everyone to walk away from it saying, "That felt like home." Now I just need to put a plan in place so that my inner-introvert isn't the loudest voice in my head...but rather, that love and servanthood would win out in our home! P.S. LOVE love L.O.V.E. the white dishes idea. I am hitting up the thrift shops this week. We are down to 5 bowls and it's getting old. On another note, I don't think hospitality always has to show itself in an invitation to come over. Hospitality can look like sending an encouraging card in the mail, or dropping off a meal to someone's doorstep, or calling someone just to hear how their week is going. You don't ever have to host a thing to be hospitable. I needed these reminders, and am so glad you decided to post them! I should point out that I hadn't thought of the white dishes either. I still have most of the pieces to a set I got for my wedding and found matching ones at a yard sale. When the supply begins to diminish, I'm shooting for the "White Plan"! Satan is the captain of the self-doubt ship. He would love to thwart our plans of hospitality by making us feel inadequate. Don't listen to his lies. I am confident that YOUR hospitality is just perfect for those who need it most! Thank you for this article! I found it encouraging that you and I do so many of the same things. I also have gone to mismatched dishes (I stock up at Goodwill once or twice a year), and I'm huge on meal ministry too - and my stock meal is very similar to yours (chicken tetrazzini!). I've also learned the lesson of not sending dishes that have to be returned. Stressful for people to have to remember, and a good way to lose dishes! :) I recently discovered that I can buy bulk aluminum pans at Sam's or Costco for even cheaper than Dollar Store prices, and I don't have to run out to replenish my stock as often. I will be trying your recipes very soon - or as soon as I can handle food (morning sickness!). Thank you for sharing! My main problem with hospitality is my own personality. I am very awkward socially, so I tend to be an awkward hostess (and when the party or group is all introverts, OY), and I also find hosting - while fun - to be also incredibly stressful. After I've hosted a few times, I find myself (mentally) gasping for breath and too exhausted to do it again for quite some time. Perhaps that will improve with time, but it is a reality that some of us are just much better hosts than others. I agree, hosting can be exhausting. But some of that exhaustion is my own doing. When I focus too much on the event, or my house, or the food, I get exhausted. I always try to remind myself, "They are not coming over to see my clean house. They are coming over to share life with me."